Here, you see a shot of all of my squares, to date. Gosh, I sure thought that there were more of them. This is my current favorite. It’s also the largest, by far! As you can see, I have my 6-ridge “hearth fire” in the middle, but instead of changing colors every log, I changed colors every 4 logs, to get a bull’s-eye effect. 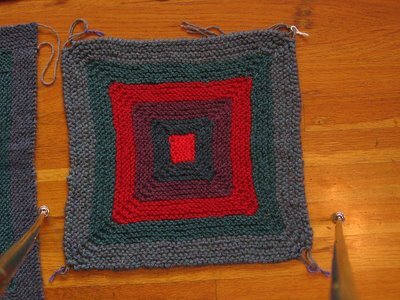 Gosh, I really like this square! I love the geometrics; I love the nice, square corners. Here is the reverse side of My Fave, to demonstrate the fact that there are no loose ends. Yes, I’m very proud of myself, lol. 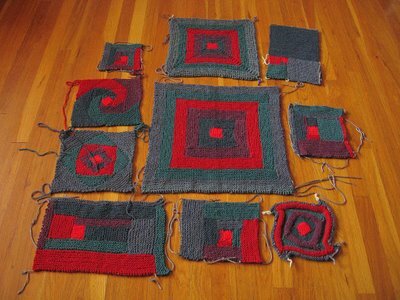 Still, the 6-ridge hearth fires, but instead of doing one log at a time, I picked up all around the central “fire,” and I knitted out from the center, increasing one stitch after the first stitch and before the last stitch of each side, on the purl rows. 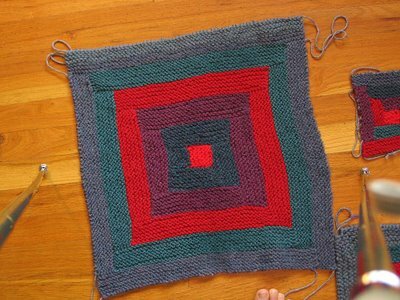 In other words, I increased 8 stitches, every other row. I like this square well enough, but it just doesn’t have the “pop” that the other one does. I’m certain that it is the lack of nice, sharp corners which makes the difference. Now, these squares are great fun! Not exactly log-cabin, but close enough. Notice that even though these squares look very different, they are made exactly the same – it’s the color placement which makes the difference. 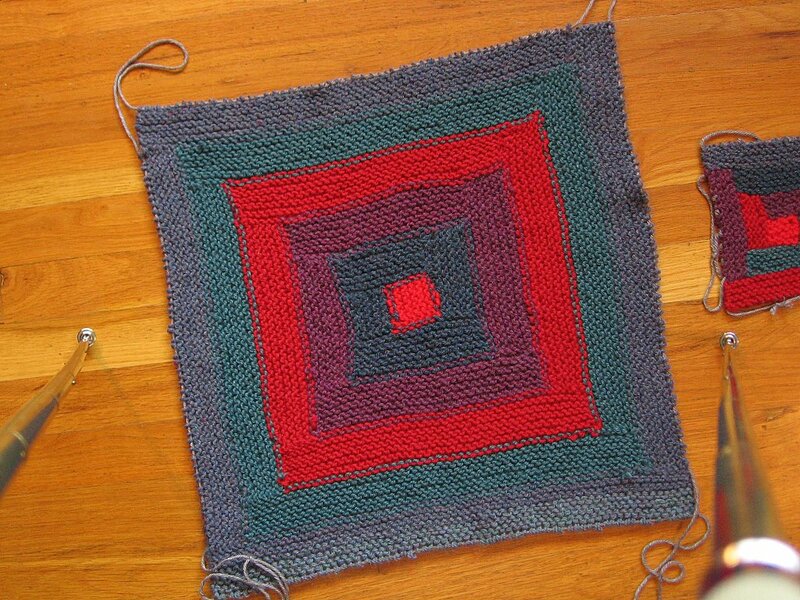 First, I had the 6 live stitches remaining from knitting the central square. I switched to another color, making 2 additional stitches along this side, and then I decreased on each side when knitting the right side row. 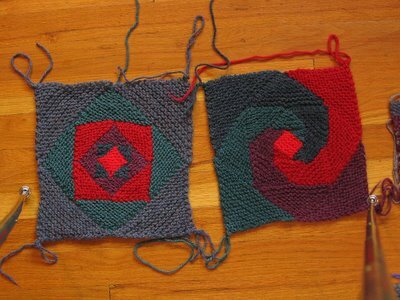 (Next time, I’m going to decrease at the beginning of each row – same mathematics – easier knitting.) So, since I started with 8 stitches, I ended up with 8 ridges on this initial triangle. Just remember – pick up a stitch for each ridge, just as in log-cabin knitting, but make 2 more stitches. 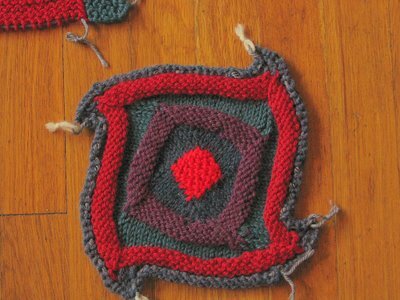 However, when picking up after the central square, you are picking up along 2 different triangles, so you have to add 2 stitches for *both* sets of triangles. Get it? My square looks like it has swirly edges, but actually, the waviness is due to the bias of the pattern, and I’m completely optimistic that these edges will become straight when they are bound to another square. Sort of like buddy-taping a broken toe, kwim? 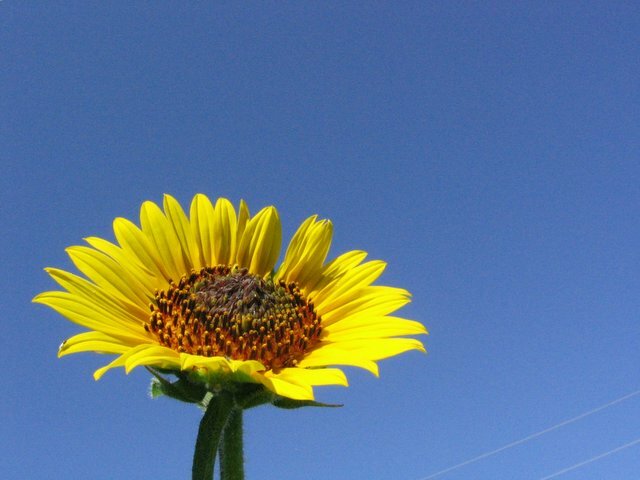 This is my hope – we’ll see. How am I going to put this all together? Your guess is as good as mine. I plan to pick up all along the edge of each square, and knit out a few ridges, in black yarn. Then, I plan to either kitchener it all together, or think of something else. Hmmm… I’ll work on it. In the meantime, if you have any spare scraps of Plymouth Encore in Black, send ‘em my way, OK? Thanks. I LOVE it!!!! No black encore here though..sorry! Your blanket is super! Makes me want to take another look at Mason Dixon knitting. I love those two squares that look so different but have the same pattern, especially that swirly one. I'll be interested to see how you piece them all together.